We’d love your help. Let us know what’s wrong with this preview of Trouble in Store by Carol Cox. Fired from her most recent governess position, Melanie Ross must embrace her last resort: the Arizona mercantile she inherited from her cousin. But Caleb Nelson is positive he inherited the mercantile, and he's not about to let some obstinate woman with newfangled ideas mess up all he's worked for. He's determined to get Melanie married off as soon as possible, and luckily Fired from her most recent governess position, Melanie Ross must embrace her last resort: the Arizona mercantile she inherited from her cousin. But Caleb Nelson is positive he inherited the mercantile, and he's not about to let some obstinate woman with newfangled ideas mess up all he's worked for. He's determined to get Melanie married off as soon as possible, and luckily there are plenty of single men in town quite interested in taking her off his hands. To ask other readers questions about Trouble in Store, please sign up. “Fired from her most recent governess position, Melanie Ross must embrace her last resort: the Arizona mercantile she inherited from her cousin. But Caleb Nelson is positive he inherited the mercantile, and he's not about to let some obstinate woman with newfangled ideas mess up all he's worked for. He's determined to get Melanie married off as soon as possible, and luckily there are plenty of single men in town quite interested in taking her off his hands. Spiritual Content- Proverbs 3:5-6 at the beginning; Scriptures are quoted, read, & remembered; Bible reading; Prayers & Thanking God; Church going & sermons; ‘H’s are capital when referring to God; Mentions of God; Mentions of prayers, praying, & answered prayers; Mentions of Bibles, those & events in the Bible; Mentions of a pastor, services, sermons, hymns, & church going. Negative Content- Minor cussing including: a form of ‘dumb’, an ‘idiot’, and a ‘stupid’; Some eye rolling; Fighting, Being attacked, & Almost drowning (up to semi-detailed); Fires & being trapped in smoke (barely-above-not-detailed); Mentions of murders, how they happened, dead body, wounds, & blood (barely-above-not-detailed); Mentions of possibly other murders; Mentions of fighting, hitting someone, injuries, & blood (barely-above-not-detailed); Mentions of criminals & a murderer; Mentions of poison; Mentions of fires & smoke; Mentions of threats; Mentions of jail; Mentions of alcohol, drinking, drunks, & saloons; Mentions of gossip & rumors; A few mentions of a possible lynching mob & mobs; A few mentions of tobacco; A few mentions of lies & lying; A few mentions of spankings; A couple mentions of a battle & death; A couple mentions of gambling; A couple mentions of cigars & smoking; A mention of a possible hanging. *Note: A few mentions of a wife and baby who died in childbirth; A few mentions of a woman’s bosom; A mention of butting heads. All in all, Trouble in Store w Trouble in Store was an entertaining read. As I expected going in, I found the story fun and enjoyable. I didn't expect the thread of suspense in the story, but I absolutely loved it (even if I did kind of suspect who was behind the murders). Trouble in Store is a light read with a mystery and a mild romance at its center. I thought the setting was very well done; I really got a feeling for the town of Cedar Ridge and the landscape of Arizona. The story felt firmly set in its place in history. I really enjoyed the mercantile setting as well. I loved reading about the now historical items that customers bought then, particularly the tonics and remedies that they put such trust in. At times, the interactions in the store were quite com Trouble in Store is a light read with a mystery and a mild romance at its center. I thought the setting was very well done; I really got a feeling for the town of Cedar Ridge and the landscape of Arizona. The story felt firmly set in its place in history. I really enjoyed the mercantile setting as well. I loved reading about the now historical items that customers bought then, particularly the tonics and remedies that they put such trust in. At times, the interactions in the store were quite comical, particularly during the scene where a little boy sets up his toy soldiers on customers, ahem, bustle! The lead characters were not as compelling as I felt that they could have been, particularly the main character, Melanie. In the beginning, I felt very connected to her and empathized with her plight as a single woman without the protection of family or a guardian. I also admired her gumption to move away from everything familiar and start a new life as a partial store owner, halving ownership with Caleb, whose uncle owned half of the store before him. At times I had trouble believing that she would be as stubborn as she acted, especially when Caleb had obviously been running it longer. Personally, I felt that Caleb was the more intriguing character, being a single father to a rather rambunctious little boy. I wanted the characters to communicate; that kind of conflict just doesn’t do it for me when it could be as easily resolved as having a simple conversation. The mystery was light & well-done. I was trying to figure out the culprit then was pleasantly surprised when it turned out that I was wrong. There is quite a colorful cast of characters going around, and I accused the wrong person for nearly the entire story. I recommend this for readers looking for a light, historical mystery with just pinch of romance thrown in. I have Love in Disguise on my Kindle and am looking forward to reading it in the future. The heroine ruined this book for me. I couldn't stand the way she treated the hero in the first half of the book, and it only got slightly better in the second half. She pushes her way into supposedly helping him with the store, then takes over. She doesn't listen to him and implements her ideas without talking to him. She acts like he has no idea what he's doing, when he has successfully run the store for quite awhile. It really annoyed me. I didn't finish the book when I first started it. The o The heroine ruined this book for me. I couldn't stand the way she treated the hero in the first half of the book, and it only got slightly better in the second half. She pushes her way into supposedly helping him with the store, then takes over. She doesn't listen to him and implements her ideas without talking to him. She acts like he has no idea what he's doing, when he has successfully run the store for quite awhile. It really annoyed me. I thought this book was fantastic. I was excited to receive this book for free from Bethany House Publishers. The description sounded very intriguing! Mystery, danger, intrigue, romance, and all in a good, clean Christian book... it was right up my alley! I was not disappointed. Trouble in Store by Carol Cox is a fantastic book with in-depth characters and a great plot. Melanie Ross feels like her world is breaking around her. After being abruptly fired from her position as a governess, she doesn I thought this book was fantastic. I was excited to receive this book for free from Bethany House Publishers. The description sounded very intriguing! Mystery, danger, intrigue, romance, and all in a good, clean Christian book... it was right up my alley! I was not disappointed. Trouble in Store by Carol Cox is a fantastic book with in-depth characters and a great plot. Melanie Ross feels like her world is breaking around her. After being abruptly fired from her position as a governess, she doesn't know what she is going to do. Then she remembers that when her only remaining relative passed away, she was offered a place to stay AND a job! So she heads out west determined to make this work. If not, what will she do?? Caleb Nelson does not need a woman telling him what to do. On top of everything else going on in his life, he just wants to focus on running HIS store, raising his son, and figuring out who keeps leaving these threatening notes for him to find. So when Melanie shows up claiming that half of the store belongs to her, Caleb is furious! He plots a way to get rid of her by marrying her off, which he reasons shouldn't be hard to do. It's the west after all, there are way more available men than there are women! But when notes turn to break-ins and other dangers, things change. In this sweet story of healing and God's grace, we meet two characters whose lives have been beaten and broken. Reading about these two characters emotions, we can feel the despair they sometimes feel and we can rejoice with them when they finally figure out God's plan. Carol brings the characters to life by giving them real emotions. I can relate to Melanie because I know what it's like to smile when inside you're crying. I can relate to Caleb because I know what it's like to just want some consistency and normalcy after tragedy strikes.She does an excellent job of creating a message of faith and God's unfailing love, all while not being too preachy. The message is this: God creates beauty from the ashes of your despair. Don't give up! You're sorrow will turn to joy and your heartache will turn to rejoicing in HIS time. It's a lesson we all need to learn, and reading this book might just help you do that! A light, engaging mystery set in historical Arizona. Melanie Ross goes to northern Arizona after losing her job, to the mercantile her cousin and his longtime friend and partner owned. Only, to her surprise, the partner has also died, and the partner's nephew thinks he owns the place outright. Melanie has nowhere else to go and thus hangs on tenaciously to her claim as half-owner, since she is her cousin's heir. And then strange things start happening, followed by a murder literally on 3.5 stars. And then strange things start happening, followed by a murder literally on their back step. And the cozy historical turns quite suddenly into a murder-mystery. Trouble in Store is a cute romance/mystery. l thought the characters could have caught onto a few things long before they did. It bothers me when characters are dumbed down to keep the mystery going. More character development of some of the characters would have been nice too. It was a fun read though. Trouble in Store is the story of Melanie who is an Ohio governess with a very tricky child under her care. After an accident which she is blamed for, she is fired from her job with seemingly no where to go. She then remembers a letter from her deceased cousin which compels her to move to Arizona with the intent of claiming her cousin's belongings and hopefully being invited to live and work at the store he co-owned. Once she arrives there she finds her cousin's partner's nephew is actually in ch Trouble in Store is the story of Melanie who is an Ohio governess with a very tricky child under her care. After an accident which she is blamed for, she is fired from her job with seemingly no where to go. She then remembers a letter from her deceased cousin which compels her to move to Arizona with the intent of claiming her cousin's belongings and hopefully being invited to live and work at the store he co-owned. Once she arrives there she finds her cousin's partner's nephew is actually in charge of the store now and he's not very willing to share the store with her, nor is he very inviting of her presence at all- but thankfully he tolerates her. During her time at the store she and the nephew, Caleb, get involved in a murder mystery which separates them from the rest of the town and bring them both closer together. I didn't really know what I would think of this story. Before reading it, I didn't even realize that it was part mystery. I love mysteries, even though the mystery in this book was more of a side-story at first, by the end it does become the main focus of the storyline. I found the mystery intriguing enough and I suspected almost everyone in the small town of Cedar Ridge at one point or the other. The book also proved to have some tense action-packed moments as well. The romance flowed nicely. I made a comment on my Goodreads profile that I wasn't sure how the author would steer the reader into Caleb's favor as the romantic interest. He was not very likable for the first half of the book. The romance flowed so slowly that it made it more believable when they did eventually fall in love. It never felt cheesy or forced. Don't be afraid that the book might be boring because I said the romance flows slowly- because it's not boring. There's another very likable love interest, Will. At times, I really thought the author might go with Will as Melanie's main man even though it would go against tradition. What I mean by that is, Caleb was a main character and in romances the two main characters always overcome their differences and come together. Will was just a side character. He was so likable though, I almost wish Melanie would have chosen him. I also liked how even though there were two good possibilities for Melanie's romantic interest it never came to a love triangle or anything like that. Love triangles are so cliche and I'm glad the author was unique enough not to let it come to that. I also enjoyed the humor in this book. The story could have gotten quite tense and stressful but humor really kept this story in a lighter ambiance. I also really enjoyed the setting of Arizona and sort of getting a sneak peek into its history. I haven't done very much traveling, but I have been to Arizona a few times and it's a state I absolutely adore. I've traveled to nearly all ends of the state and northern Arizona is a setting I haven't found in many books. All in all, I am giving Trouble in Store 4 out of 5 stars and I can say I am very glad that I read it. I enjoyed how it encompassed a few different genres without getting confusing or messy. I would describe this book as a historical fiction set in the wild west with a dash of romance and mystery and a morsel of action. I received this book as an Advanced Reader Copy (ARC) courtesy of Netgalley and Bethany House Publishers in exchange for an honest review. When she loses her job as a governess, Melanie Ross heads to Cedar Ridge in the Arizona Territory to claim half of her cousin’s store, as promised by his partner, Alvin Nelson. But when she arrives, Alvin is dead and his nephew, Caleb, has no desire for a business partner, especially not one of the female variety. When Melanie discovers a dead body on the back step, and they begin to suspect there might be more trouble in store… (sorry, but I couldn’t resist the pun). The murder then forms the f When she loses her job as a governess, Melanie Ross heads to Cedar Ridge in the Arizona Territory to claim half of her cousin’s store, as promised by his partner, Alvin Nelson. But when she arrives, Alvin is dead and his nephew, Caleb, has no desire for a business partner, especially not one of the female variety. When Melanie discovers a dead body on the back step, and they begin to suspect there might be more trouble in store… (sorry, but I couldn’t resist the pun). The murder then forms the foundation of the plot, as it becomes apparent that there is a mystery that must be solved. As well as the murder there have been some mysterious notes, suggesting someone doesn’t want Caleb in town. Trouble in Store is a good mix of mystery, humour and romance. The characters were likeable, and while the story focused more on Melanie and Caleb’s disagreements about the store and the mystery, there was still a nice romantic sub-plot. The story is clearly Christian, but not preachy. I really enjoy historicals like Trouble in Store. There’s nothing especially deep or challenging, but they are fun, easy to read, perfect for a snuggling down with in winter, or reading in the sun in summer. Lighthearted with good morals, and something I’m happy to pass on to my daughter. Recommended. Another amazing story from Carol Cox! Carol did a great job pulling me right into the story with the first chapter. Melanie is such an easy character to like despite her stubbornness and slight impulsive behavior. Even though I knew misfortune would befall her early on, I still hurt right alongside her. I loved her desire to improve the mercantile; however, I'm not sure her methods were the proper way to get what she wanted. Ha! Ha! Caleb is a fabulous hero! He's such a great father to his son, Le Another amazing story from Carol Cox! Caleb is a fabulous hero! He's such a great father to his son, Levi, and does the best he can to also run a store single-handedly. I thought the transition from disliking Melanie to falling in love with her was well paced and realistic. I loved how protective he is. He and Melanie make a great couple. I just studied this time period for my studies and I'm pleased to find little details in the story that I know I would have missed had I not studied this era. I also must admit I'm very impressed with how vivid the Arizona territory appeared in my mind's eye. Very beautiful, very rustic, very western. I truly enjoyed the mystery Carol implemented and I wish the book could have spanned longer. I hated seeing it come to an end! When Melanie Ross is fired from her position as a governess, she cuts her losses in the city and heads to Arizona, where she hopes to find the mercantile she inherited from her cousin. Yet, things aren't as she expected once she arrives. Caleb Nelson is positive that he inherited the mercantile from his uncle, and he's not to thrilled to find this beauty insisting she should run the store. Caleb comes up with a fool-proof plan - get Melanie married off! As more and more would be suitors walk thr When Melanie Ross is fired from her position as a governess, she cuts her losses in the city and heads to Arizona, where she hopes to find the mercantile she inherited from her cousin. Yet, things aren't as she expected once she arrives. Caleb Nelson is positive that he inherited the mercantile from his uncle, and he's not to thrilled to find this beauty insisting she should run the store. Caleb comes up with a fool-proof plan - get Melanie married off! As more and more would be suitors walk through their doors, Caleb grows more unhappy with each one. Could it be that he has fallen for Melanie? Plus there's the danger that seems to targeted at the two of them. Will they work together? As I got into the story, I found that I really liked Melanie's character. Her ideas for the store brought in more business, but it took her being patient with Caleb to really see the results. The bit of mystery in the story as well, kept me entertained. True, the story dragged at times, but overall, it was a very good book. I received this book from Bethany House Publishers for free in exchange for a review. My thoughts and opinions are my own. If you like historical fiction that takes place in the old west with romance, mystery and good characters thrown in, Trouble in Store will definitely fit the bill. This was a quick read that I finished in one day. Loved the sparks between Melissa and Caleb and the additional town characters rounded out the story nicely. This is my first read by Carol Cox and I will look forward to reading more of her works. I enjoyed this book a lot. It had a bit of almost everything that appeals to me in a book - a murder mystery, romance, action and adventure, a bit of humor. I liked Melanie as a heroine. She was rather feisty and I liked that she stood up for herself. I didn't like Caleb as much but the interplay between the two of them was pretty good. I thought Levi was a cute little kid and I liked all the trouble he got into. It wasn't the best murder mystery I've ever read but it was still good and I liked I enjoyed this book a lot. It had a bit of almost everything that appeals to me in a book - a murder mystery, romance, action and adventure, a bit of humor. It wasn't the best murder mystery I've ever read but it was still good and I liked the story a lot. Melanie Ross, a family-less young woman living in 1885, is forced to pull up her roots and move across the country to Arizona. Hoping to find grace in the eyes of her dead uncle's business partner, she is shocked to find that he, too, has passed on and in his place stands his nephew...who is also quite ready to stand in the way of Melanie's success in her new home. Thrown together through their work at the mercantile and surrounded by a string of suspicious situations, they must forge together t Melanie Ross, a family-less young woman living in 1885, is forced to pull up her roots and move across the country to Arizona. Hoping to find grace in the eyes of her dead uncle's business partner, she is shocked to find that he, too, has passed on and in his place stands his nephew...who is also quite ready to stand in the way of Melanie's success in her new home. Thrown together through their work at the mercantile and surrounded by a string of suspicious situations, they must forge together to find the answers and perhaps, their future. Pros: Inside of the gorgeous cover is found a pretty average serving of the usual "old west" fair - dusty streets, skeptical towns folk and a young woman who turns the eye of every ranch hand in town. There's nothing here that stands out to me as especially unique or the kind of material that make Carol Cox an overnight success. Nothing was especially amiss, nothing especially stood out, which is not surprising, in a genre that has been thoroughly canvassed by nearly every Christian female author since Christian fiction became so popular. Having a mystery take a leading role in the story was a pleasant, although far from new, approach to a period romance. Cons: it's only true flaw will perhaps be a matter of personal opinion and preference, and in so explaining, I shall endeavor to keep this as spoiler free as I can. Melanie Ross comes to Cedar Ridge, having traveled alone from Ohio, a penniless and semi-desperate woman, hoping that her dead uncle's mercantile partner will give her a job and a home. Finding that he is also dead and his nephew has now inherited the business, Melanie tries to find a home by claiming half-ownership of the store, on the grounds that she was her uncle's only remaining relative. She goes as far as to threaten Caleb (the nephew) that she will call in the marshal if he doesn't let her stay and through other means, uses a mild form of threat and blackmail to gain her place. He begrudgingly allows her to begin to work there, but Melanie, despite the fact that she KNOWS she has no actual claim (a fact she admits to herself freely) marches into the store and pretty much walks all over Caleb, imposing her will and ideas all over the store, going so far as to do things behind his back and without his consent. I personally found this to be not only an annoying character flaw in a heroine, but also not the kind of conduct that is right in the eyes of the Lord. It was, after all, blatent deceit and never once does she feel any real regret, repentance or even come to a spiritual realization that she's been wrong. I feel that the author gave a poor representation of how a Christian should act and I wasn't okay with that. Also, the transition from enemy to star-struck lover was very, very, very abrupt. Like, no transition at all. On one page their angry and fighting, the next page she's acting like a silly school girl and daydreaming about him. Oh please. In summary, in was a mild, average story that many will still find an enjoyable read on a slow summer's afternoon. Trouble in Store by Carol Cox was an interesting read. Right off the bat, I sympathized with Melanie and her difficult situation. She was a likeable heroine and the ending where she faced the villain was enthralling and frightening. However, I did not connect to her as much as I wanted to. Caleb didn't seem to have as much personality, other than being rude to Melanie, missing his wife, and loving his son--all of which has been used before, countless times. There was nothing particularly fresh o Trouble in Store by Carol Cox was an interesting read. Right off the bat, I sympathized with Melanie and her difficult situation. She was a likeable heroine and the ending where she faced the villain was enthralling and frightening. However, I did not connect to her as much as I wanted to. Caleb didn't seem to have as much personality, other than being rude to Melanie, missing his wife, and loving his son--all of which has been used before, countless times. There was nothing particularly fresh or original about him to draw me to him. A few other things about how the mystery was resolved didn't quite make sense to me. I couldn't understand why a murderer would bother leaving threatening notes in the mercantile when someone they could have killed slept upstairs. Melanie was vulnerable this entire time, but the villain did not make a move until the end of the novel, which made no sense to me, criminal-wise. What was refreshing to me was that the romance was not constantly dwelt on. In fact, Melanie had one other suitor whom I actually think I liked more than Caleb, and whom I hope gets his own story one day. I felt he was pushed to the side too quickly. The reverse side to not talking much about the romance was that when Caleb and Melanie go from arguing to loving each other, the shift seems too abrupt. While I understand and appreciate the author's attempt to make it natural, growing from 'enemies' to friends to romantically-involved, it still jolted me when Caleb described Melanie as "the woman he loved" when perhaps a month or so earlier he'd still been grumbling about all the changes she was making to the mercantile. I wanted some more time for their relationship to grow. As well, at times Melanie was completely clueless, asking questions about the obvious. One instance she and Caleb were discussing how the intruder could have gotten into the mercantile and find a window which had been tampered with by a knife. And Melanie asked what it meant. I had to shake my head in disbelief, because it seemed pretty obvious to me. There were a lot of typos in the version I read, which threw me off quite a bit. That's something the editor should have caught, but it still hampered my overall enjoyment. I received a free copy of this book from NetGalley and Bethany House Publishing in exchange for an honest review. Thank you for the opportunity! unbeknownst to her the partner had died also and his nephew had inherited the store, Caleb had a small son and had settled in running the store when all of a sudden Melanie arrives saying her cousin owned part of the store and she had inherited his share. Life soon becames all topsy-turvy for Caleb and he wants things to stay the same. The customers come to like this spirited young woman and as she settles in she finds she likes Arizona just fine. The town becomes unsettled when there is a death on the back step of the store and soon they have put two and two together and decided there have been too many deaths in a short period of time and the sheriff has hard time keeping them from forming a group that will take the law into their hands before they know all the facts. Reading this book gives us so much to think on, a young woman needing help..so helpless. a young man raising his son needing help but not wanting to accept it... can these two see through all there troubles and find a way to help one another. I’m writing this review in exchange for receiving a free copy of this book through Netgalley! This book, while okay, wasn't gripping. It's an easy, light read - which is often welcome. But I found myself wanting a little more, and didn't get it. We have a heroine in a bad situation, realizing that she’s not really cut out to be a governess but can’t do anything else. She gets summarily canned, without a reference, but wait! She suddenly finds out that there’s a place for her to go out west. Using I’m writing this review in exchange for receiving a free copy of this book through Netgalley! We have a heroine in a bad situation, realizing that she’s not really cut out to be a governess but can’t do anything else. She gets summarily canned, without a reference, but wait! She suddenly finds out that there’s a place for her to go out west. Using the last of her money, she plans to throw herself on the mercy of her late uncle’s business partner. But wait again! The business partner is also dead, and the store was inherited by a man who is very protective of his business interests and wants nothing to do with this nosy woman who lands herself on his doorstep. You can probably write the ending without reading it. It’s a predictable story. Although Cox tries to give it a little extra spice by bringing in a murder mystery, the “twists” aren’t enough to distract from how downright boring the romance is. The heroine is hard to root for, as she’s not very nice. Neither is our hero. They’re both stubborn and prideful, and never really come to grips with that. Characters don’t have to be likable – many compelling stories are written about despicable people – but they do need to be interesting. I don't know what made me pick up a second book by this author. A sense of the ridiculous, I think. I finished Love in Disguise because I told myself it couldn't get any more absurd. But it did! Picking up Trouble In Store was a continuation of that. A sense of...it can't get any more silly, can it? Positives....this book was clean, lighthearted, and there was no giant Come To Jesus Moment where everything Suddenly Works Out. The characters' moral character stayed consistent t I don't know what made me pick up a second book by this author. A sense of the ridiculous, I think. I finished Love in Disguise because I told myself it couldn't get any more absurd. But it did! Picking up Trouble In Store was a continuation of that. A sense of...it can't get any more silly, can it? Positives....this book was clean, lighthearted, and there was no giant Come To Jesus Moment where everything Suddenly Works Out. The characters' moral character stayed consistent throughout and made it more believable. I actually felt like the real couple understood each other, and not some "other perfect person" they had created in their own minds. There was this one scene that just threw me from mildly amused to incredulous. Spoiler. If that isn't enough, bad guy later represents and apologizes for jumping to conclusions. Like, what? So....not a bad read but kind of a silly one. This was the first of Carol Cox's books that I've read and I have to say, It was a fun read. I loved her characters. They were each well balanced and lovable. This book was a quick read but I really enjoyed it. There was mystery and romance and a bit of comedy thrown in there to balance everything out. The only thing that I didn't like was that it didn't have enough of a faith message. By the end of it, I found myself almost trying to read between the lines and find a take away message that I coul This was the first of Carol Cox's books that I've read and I have to say, It was a fun read. The only thing that I didn't like was that it didn't have enough of a faith message. By the end of it, I found myself almost trying to read between the lines and find a take away message that I could say was a learning or growing faith moment. I didn't really feel like there was anything. there were some hints of it and there were a few, small moments where the author wrote a few sentences about different things the characters were learning or what their beliefs were but there wasn't anything major. On the whole, the faith message was there, but it was very light. There's nothing wrong with that, I just prefer to have a bit more faith building in the books I read. I like not only being able to read a great book but also feel that I've come away from it as a better person. That didn't happen in this book for me but I still enjoyed it outside of that point. Melanie and Caleb is part owner of a store. Can the closeness that they are finding with each other survive? Check the rest of my review this week at http://rebakaspot.blogspot.com/. Trouble in Store has romance, humor, mystery and suspense all rolled up into one fantastic book. Carol’s characters have depth to them that makes them seem real and connects with the reader. I had to give this 5 stars. The author did a fantastic job at setting up the mystery aspect of this story and the life lesson was one I needed to hear right now. Along with that, the characters were lovable, the descriptions humorous, and the bit of romance sweet. I look forward to more from Carol Cox. A bit slow at the start, but once I got into it (which didn't take too long) I really enjoyed it. An orphan who barely knew her parents, Melanie Ross has worked as a governess following the death of the grandparents who raised her. Although she doesn’t love her position, she’s devastated when she’s fired. Who else can she turn to? Her last living relative, a cousin residing in Arizona, had always told her she had a place in his mercantile—but now that he’s dead, Melanie isn’t sure where to go. Hoping that her cousin’s business partner will take her on as an employee, Melanie spends her last An orphan who barely knew her parents, Melanie Ross has worked as a governess following the death of the grandparents who raised her. Although she doesn’t love her position, she’s devastated when she’s fired. Who else can she turn to? Her last living relative, a cousin residing in Arizona, had always told her she had a place in his mercantile—but now that he’s dead, Melanie isn’t sure where to go. Hoping that her cousin’s business partner will take her on as an employee, Melanie spends her last paycheque on a train ticket to Arizona. But when she arrives, Melanie is stunned to discover that her cousin’s business partner has also passed away, leaving the shop in the hands of his nephew, Caleb Nelson, and his young son, Levi. Caleb has his hands full running the mercantile and raising his son, and he isn’t keen for Melanie’s interfering suggestions on how he can improve the store. But he can’t turn away a young woman who has no place to go—not to mention a reasonable claim to her cousin’s share of the store—so he allows her to stay, secretly hoping that she’d marry one of the local ranchers and be out of his hair quickly. Having loved Carol Cox’s previous novel, Love in Disguise, I looked forward to delving into her newest romantic mystery. I was a little worried that I was setting myself up for disappointment as not a lot seemed to happen at the start of this book. A lot of time was spent introducing the town and characters, and setting up for the mystery around which the plot was to centre. It wasn’t until halfway through the story that the plot really seemed to get started, and it finally grabbed my attention. If you’re usually put off by slow stars, do stick in there with this novel—the second half of the book is well worth waiting for! Despite his initially cold demeanour, I really liked Caleb. He might seem a bit off-putting when he’s first introduced, but he has plenty of flaws and insecurities about raising his son and pleasing his customers that make it hard not to care about him. His son, Levi, made for several amusing moments, including one involving toy soldiers and the mayor’s wife’s bustle that made me nearly laugh out loud. Unfortunately, I never felt like I got to know Melanie as well as I did with Caleb. The main things we discover about Melanie are that she’s an orphan, an ex-governess and very stubborn about doing things her own way. Other than these initial facts—most of which the reader learns in the first few chapters of the novel—I didn’t feel like Melanie really learnt anything or had to overcome any flaws or fears in order to achieve her happy ending. Since I never really got handle on her motivations (besides needing a job and somewhere to live) it was difficult to relate to her and root for her to get the guy. A lot of time was putting into developing the backdrop of Arizona, the town of Cedar Ridge and the secondary characters, all of which were easily to visualise. The descriptions of Arizona were fascinating and made me wish that I could see the landscape up close. I found myself hoping that Carol decided to return to Cedar Ridge in her next book so that we could revisit some of the more colourful characters (like Mrs Pike and the Professor) Will Blake can get his own happy ending. The mystery aspect was what I loved so much about Carol's first book, so I was pleased to discover a good helping of suspense and intrigue in Trouble in Store. As the mystery progressed, I developed two theories about who the killer was, and I was pleasantly surprised when one of them turned out to be true (even if it was my more predictable theory). My one complaint about the mystery is that the section at the end of the novel when the killer is monologuing about why he killed the victims and what he plans to do next felt rather cheesy and unrealistic. I do like to find out the killer's motivation in a mystery novel, but I'm not a big fan of monologuing. Does anyone actually do that in real life? The romance in Trouble in Store was sweet and pretty slow moving, but the ending was satisfying. I was worried that the romance would get pushed to the side by the mystery, but it actually meant that Melanie and Caleb had something that forced them to unite and work together, despite their differences. This made for a more believable progression of their relationship, given how stubbornly opposed to each other they had been in the first half of the book. Although there is plenty of chemistry evident throughout the novel—despite Melanie’s efforts to ignore her attraction for Caleb—I don't think that they actually kissed until the final chapters of the book, so this is definitely one of the lighter romances I've read lately. 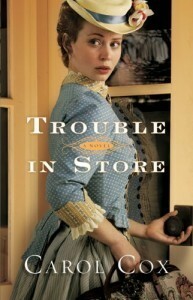 Trouble in Store didn't quite live up to my first Carol Cox novel, but it's definitely going to please a lot of fans of western romance, especially those who enjoy a good mystery. Melanie was to undertake the control of seven young children at a party that was geared to a political nomination from the guests. To play outside, only gave fuel to the mayhem, as only children know when outdoor. Being her employees didn’t get results they wanted, the children were suppose to be prime and proper, she got fired, Going to an uncle to help in the mercantile store,to find he is deceased. The two that started the place, left it to cousin’s. With her changing things in the store, can Melanie was to undertake the control of seven young children at a party that was geared to a political nomination from the guests. To play outside, only gave fuel to the mayhem, as only children know when outdoor. Being her employees didn’t get results they wanted, the children were suppose to be prime and proper, she got fired, Going to an uncle to help in the mercantile store,to find he is deceased. The two that started the place, left it to cousin’s. With her changing things in the store, can she change him. With his children and the mischief they enjoy. A mystery and Melanie is in danger, adds to this story, enjoyable to read. There was a little bit of a mystery involved in this romance. A bit of the usual with a twist. Melanie moves west and when she gets to town and tries to stake her claim in the general store Caleb tries to drive her away with a few schemes. But then things start to get a bit crazy with a few break ins and a dead body. Who is behind the problems? Instead of driving Caleb and Melanie apart it pushes them closer together as they try to solve the trouble and keep the town from mobbing their store. I had trouble with this one, I won't lie. The heroine irritated me most of the beginning of the book, and the hero seemed like a push-over. The mystery was intriguing, and I wanted to find out what was going on so I kept reading. I admit that I'm glad I did. The second half, the characters improved and the mystery of what was going on got even more interesting. I liked how it was all wrapped up. Maybe this book wasn't my cup of tea, and I do plan to read more of the author. You can’t help but relate to Melanie if you have ever had to deal with children. Very strict but oh so loving. Life throws obstacles at each and everyone of us. Caleb was struggling but yet held it together. He jus5 didn’t know what he and Levi really needed in their life. Meh. It finished more strongly than it began, but since I actively disliked the main female character for more than half the book I’m knocking it down to a 2. The storytelling felt flat until the last bit of action. I remain unconvinced that the main character would be a kind, loving mother (or a kind, loving governess, for that matter...). A bit of humility could have gone a long way. Great story, fun and amusing characters, mystery, suspense and some sweet, tender moments. I really enjoyed reading this story. I look forward to reading some more books by Ms. Cox. Carol Cox has an abiding love for history and romance, especially when it’s set in her native Southwest. As a third-generation Arizonan, she takes a keen interest in the Old West and hopes to make it live again in the hearts of her readers. A pastor’s wife, Carol lives with her husband and daughter in northern Arizona, where the deer and the antelope really do play—within view of the family’s fron Carol Cox has an abiding love for history and romance, especially when it’s set in her native Southwest. As a third-generation Arizonan, she takes a keen interest in the Old West and hopes to make it live again in the hearts of her readers. A pastor’s wife, Carol lives with her husband and daughter in northern Arizona, where the deer and the antelope really do play—within view of the family’s front porch.